As a driver, you work hard, run hard and expect to be paid well for your efforts on the road. For drivers who have paired with a company that they have come to know well and that they trust, an upcoming day pay likely isn’t a problem they face. For those looking to pursue a trucking job, there may still be many lingering questions about how finances work and the pay settlements that seem to fluctuate across the industry. It can be tough to understand the difference between “fair” pay and what is “livable” pay when first breaking into the industry. But with some research, drivers can determine when pay is both beneficial and satisfactory for the job at hand. Luckily, many carriers today have established programs that attract drivers and compensate them well. No driver should be underpaid for their work or have to endure a carrier that promises an I.O.U. instead of a pay settlement. Yet, when pay works in the favor of a driver can be an entirely different matter. Many rules regarding payment to drivers will differ on a state-by-state basis. For example, every state – except for Alabama and South Carolina - require employers to provide payments on a weekly, biweekly, semi-monthly or monthly basis. Many states have different laws regarding the type and classification of a laborer, dividing workers into several different categories for mandatory pay. Preferences and particular company policy aside, no truck driving job can go unpaid outside of the carrier’s specified pay period. In other words, there is little to no room for a company promising a pay settlement or paycheck every week and then defaulting on that with the promise of a later date for payment. The Fair Labor Standards Act governs that that an employer must pay an employee for the time they worked. If a trucking company willfully does not pay their driver on time – they forgot to send in payroll, money was withheld a few days because cash was tight - then there is a case to be made for a driver to receive compensation for their otherwise promised paycheck. It’s important to bring up the issue of late payment with your company or your company’s payroll department, despite how uncomfortable discussing finances may be. Getting this conversation out of the way early on can save drivers and employers a great deal of headaches and confusion down the road. 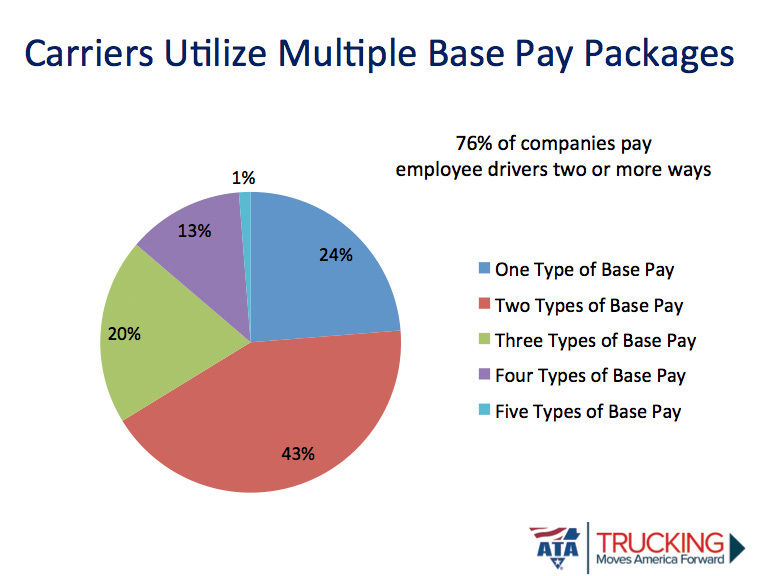 The type of pay settlement that is most beneficial for a trucker job will vary depending on several factors. One’s area in which they work, type of runs they prefer and experience level or ability to acquire endorsements also greatly impacts what pay they can or will receive. The various trucking companies in Texas may not all be uniform in their compensation practices, but a driver in the state is very likely to see a large pool of options for pay. Typically speaking, hourly pay is not as common a pay structure as is cents per mile (cpm) for drivers. However, for those who are paid on an hourly basis, the average pay is around $22.63 per hour, as last reported by the Bureau of Labor Statistics for March 2017. This compares to the overall average projection of an hourly wage for a United States worker at $26.14 per hour in March 2017. It is much more common for a trucking company to pay its drivers a cpm wage. With this system, a driver is likely to see somewhere between $0.28 and $0.40 cpm, on average. So, what exactly is more beneficial for a driver? Hourly Pay – payment by the hourly generally benefits those who are making local runs. For the driver who sets out early in the morning to get back for nightly home time, clocking approximately 40 – 50 hours a week earns them a hefty paycheck with an hourly pay plan. Furthermore, local drivers may not be racking up as many miles as OTR drivers or those running regional lanes – in this sense, the hourly pay structure is much more practical. However, if a day is sallow in required deliveries or pickup or if specific runs are nearby, a driver may not see as many hours from day to day. Another pitfall of hourly pay is when certain companies do not pay for time when a driver is unloading or loading, or waiting to hear back from dispatch or their fleet manager. Where some drivers may be spending their time chasing down the long white line and seeing payment, other drivers may just be subject to killing time. Cents Per Mile – While OTR drivers are certainly not at a deficit for time spent on the road, there are many reasons why they may prefer a pay structure that reflects cents per mile driven rather than an hourly wage. The ATA reports that drivers paid per mile generally make more than those paid hourly, though that may not always be the case. Many drivers enjoy a cpm payment plan because they can more easily predict their projected earnings for a specific period. In doing so, they can budget themselves better and not just see good pay, but see a forecast of their finances in order to feel financially stable and well-prepared. However, the cpm payment plan may be problematic in areas of high traffic or where weather causes delays on the road. Drivers stuck in gridlock or facing road undesirable road conditions may feel overworked and underpaid in some situations. 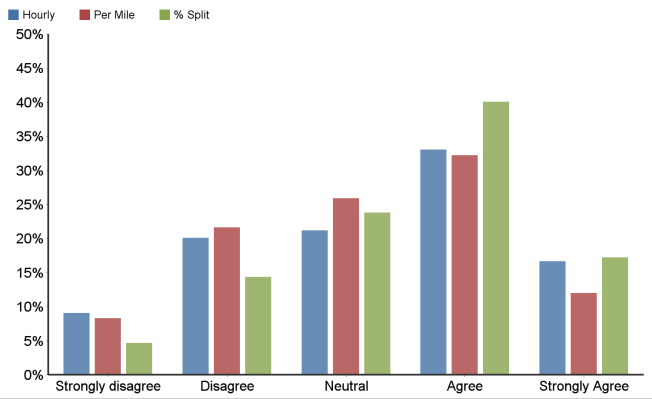 Percentage Split – A fairly popular trend emerging in payment structures, drivers on this plan receive payment from a percentage of the invoice that is billed to the customer and are not paid hourly or per mile. Generally speaking, owner-operators are the drivers that see the most benefits from this type of payment. Fresh-faced drivers or those new to the industry may not prefer percentage split payment, as they are assuming the risk and expenses of these loads. Furthermore, some companies may take greater overhead than expected – it’s important to stay on top of the amount the driver is personally receiving to ensure that a company is not claiming too much overhead. Overall, a driver likely knows what they are getting themselves into when signing on with a company. When recruiting new employees, a company is generally transparent about their pay structure. There are, however, a few ways in which a driver can potentially increase their salary for cpm or hourly wages. Experience – many companies offer a slightly higher payment for veteran drivers who have some demonstrated experience on the road. This increase is wage may not be an enormous boost from what is offered to inexperienced drivers, but a bump in salary is rarely a drawback. Safety – Many carriers may tack on safety bonuses per mile for drivers who have a clean driving record that speaks for themselves. Trucking companies enjoy hiring drivers who are not a liability on the road and they often enjoy rewarding drivers with incentives to ensure that they continue to drive diligently. Competition – Some carriers believe in programs that inspire some friendly competition – perhaps offering a special pay rate to drivers who log the most miles that are considered safe miles. This gives drivers more opportunities to earn miles at a base rate, and gives an ancillary opportunity for drivers to earn more at a special rate. Payment – Is Frequent Better Than Infrequent? Take, for example, a driver who works in Southern California and gets paid by the hour. The driver works close to 60 hours a week, navigating the countless and tricky highways of the Greater Los Angeles area. The company the driver works with is small, and pays its drivers once a month, as is the company policy since it started 30 years ago. There is absolutely no way the driver can negotiate being paid more frequently, and they enjoy the company benefits and opportunities, but it is difficult to budget when expecting a paycheck twice a month. There’s no simple answer to the above hypothetical scenario other than developing a budgeting plan to best fit the individual needs of a driver. Simply because one gets paid once a week versus once a month, it does not mean that they will necessarily excel financially. Weekly/Bi-Weekly Pay – Typically, this type of payment is more common in the industry and pleases more drivers because it means seeing money more quickly. In today’s environment, a great deal of carriers heavily promote weekly pay settlements, as they have found that drivers value more immediate pay for their hard work. Drivers may find it is easier to manage payment that comes in more frequently, but they must also beware - when money becomes available, some drivers are likely to spend it quickly. Monthly/Semi-monthly Pay – Though less common, states reserve the right to establish payment schedules as they please. It is often entirely arbitrary which states and areas choose to provide more (perceivably) archaic forms of payment. A trucker working in the metropolitan area of Florida is not necessarily subject to weekly payment, nor is there any rule prohibiting this frequency. Some drivers prefer payments that are once a month because it forces them to act economically and spend less money. Monthly payments amount to being the same as four weekly payments so drivers should not be concerned about receiving less money. However, every driver’s financial situation is different. Some may struggle to pay bills on time when only seeing a paycheck once a month; others can anticipate devoting their paycheck to a bill when they coincide at the end of the month.